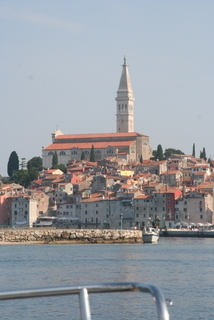 Have ICI in Pula book us a dock in Ravinj expecting it to be busy. Leave Pula around 14:00 and sail for a while in 8kn NW. Wind dies & clocks so start to motor. Stop off Otok Katerina on the entrance to Ravinj for a swim, then come into marina around 17:30. Lots of space available. Water is crystal clear. Temperature in the sun is hot. Wander into town after sundown and have dinner at Puntulina which hangs over the harbour just before the climb up to the church. Mags has olive crusted orada which is excellent. Saturday - Court arrives from London. Wait for the heat of the day to do the trek around our beautiful town. Up the church tower to view all the islands and bays surrounding Ravinj. Back to the boat for a nap before heading out to Monte's for dinner. 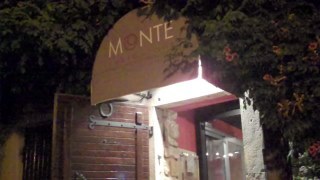 Monte's improves on our previous experience - creative menu ideas, great presentation. 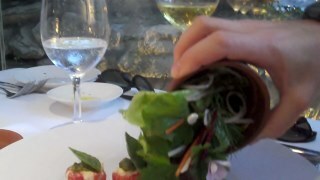 Court has the tomato salad starter that Linda Longmire had a month earlier - a few tomatoes on plate with a spots of balsamic are delivered along with a small clay flowerpot with lettuce leaves appearing to grow from an earth of balsamic cous cous. Turn out the pot and a beautiful salad is there. Other dishes equally beautiful. 400 kn pp.